"Timeless Arena Design" is long for "curved"
Samsung has launched its 55-inch curved OLED TV, which it demoed at CES earlier this year. The gargantuan curved set will be available to purchase in South Korea, although there's no word on when it will be available for international markets just yet. It also comes with a rather large price-tag - 15 million Korean won (about US$13,000, £8500, AU$13,950) - though Samsung is hoping to tap into a new market of viewer that it obviously thinks will pay up for the added advantages. For those who don't have TV tastes in common, the OLED TV comes with a multi-view option where users will be able to watch two separate TV shows on the same screen. This is made possible via 3D technology and 3D glasses that come with built-in earphones that deliver separate audio. Samsung says that the curved screen allows for a better viewing angle as it "mirrors the curvature of an arena". The feeling of being in an arena is the minimum you'd expect for the price. The TV will also come with Samsung's Evolution kit, which Samsung says will "future-proof" its high-end TVs. 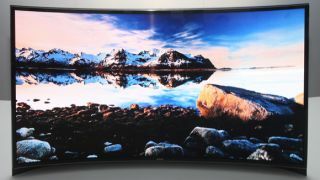 Samsung isn't the first to market with a curved TV though, getting pipped to the post by LG back in April.